India is a Sovereign Socialist Secular Democratic Republic with a Parliamentary form of government which is federal in structure with unitary features. There is a Council of Ministers with the Prime Minster as its head to advice the President who is the constitutional head of the country. Similarly in states there is a Council of Ministers with the Chief Minister as its head, who advices the Governor. This section provides insight of Indian governance and administration at the Central, state as well as local level. 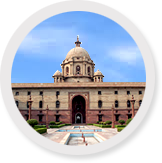 Information about the Constitution of India, Parliament and Legislature, Union administration, state, district and local administration is given.